How do I setup auto subscription for my Limeproxies account? By adding credits in the dashboard in advance for your proxy product. Add the credits you want to in the credits page and click on “Make Payment Now”. For example, if you had bought 10 proxies at 50$, you can add 100$ in advance and the product will auto renew. 2. 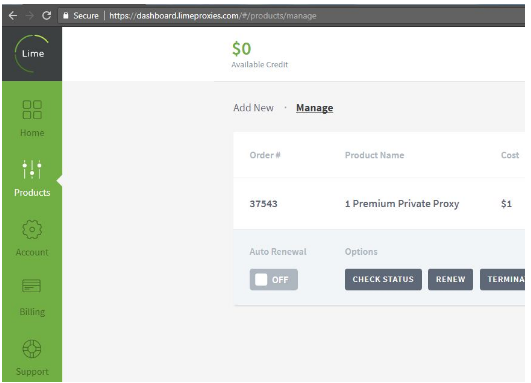 If you would like to setup automatic charge on your credit card each month, please sign up for a new product through our website limeproxies.com and choose monthly recurring. For existing customers, you can also purchase the proxies from the Dashboard using Fastspring as payment gateway. Select the Package from our website. By default monthly recurring option is enabled. Click on check out and proceed with the payment.